How many millions for a theater? Once we've got your money, we get to play with it! Whoopee! This campaign was designed by TBWB Strategies. We figured out just the right words to get you to you to open up your checkbook. "To upgrade College of the Canyons' classrooms, labs/technology to prepare students for four-year college/jobs in science, aerospace, teaching, nursing/manufacturing, accommodate growing student enrollment, expand veterans' services/public safety training, upgrade accessibility, enhance parking, improve earthquake safety/qualify for State matching funds, and construct, acquire, repair classrooms, sites, facilities/equipment, shall Santa Clarita CommunityCollege District issue $230,000,000 in bonds at legal rates, with independent citizen oversight, mandatory audits, no funds for administrators' salaries and all funds staying local?" College of the Canyons needs more classrooms, labs, and parking to relieve overcrowding. Vote YES on Measure E.
Santa Clarita Valley students receive an excellent education at College of the Canyons. 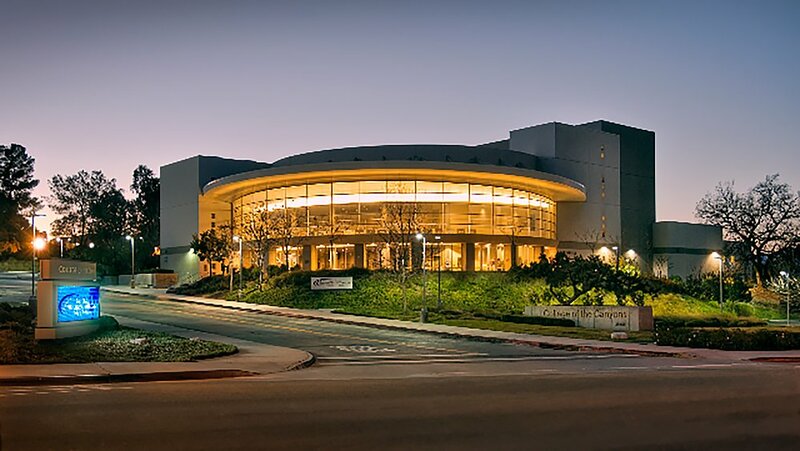 More and more local students turn to College of the Canyons for a high-quality, affordable alternative to the rising costs of four-year universities and crushing debt. Local residents depend on College of the Canyons to learn necessary career skills in award-winning programs. Enrollment surpassed 20,000 students this year. Projections show it will climb 50 percent to 30,000 in just over 10 years. Already, 4,000 students are waitlisted every semester, unable to get English, math, science, transfer and career training classes. Nursing, law enforcement, and firefighting programs turn away students for lack of classrooms and labs, despite rising shortages in these critical professions. Our community's economy requires more well-trained employees. Employers and students need College of the Canyons to provide top-notch technical training in emerging, high-demand fields. By law, no Measure E money can be spent on administration salaries. Independent audits and an oversight committee ensure strict accountability. How many extra charges are already on your property tax bill? With interest? Lasting decades? Renters, do you really think your landlord won't raise your rent to cover these added costs? Google: California Policy Center: Voters Wary Borrowing Billions More for Educational Construction; Thanks a Billion Poway. This is the third bond in 15 years. Measure C� $80 million; Measure M �$160 million with $20 million left. Measure E at $230 million almost the prior bonds combined. Can you really afford another? College is important. But think with your head and wallet�not your heart. This is snake oil crafted by an unscrupulous alliance of Wall Street bond sellers, financial advisors, school and bond attorneys, architects, construction contractors and other "consultants" who will profit at your expense. Google: Orange County Register's Bankers Push School Bonds C.A.S.H. Look who's financing the Yes campaign. There's historical correlation between campaign contributors and who profits. Google: Local School Bonds Big Donors Win Big Contracts. Reject "PAY TO PLAY"! Google: Centinella school corruption. The "Project List" for Measure E is generic "pie in the sky". There's no guarantee any particular thing will be done at any particular location. No specifics equal no accountability! The District already has over half-million square feet of usable space. How much will this bond add? How much is needed? Under Measure E District can buy things�like iPads�that you'll pay for longer than they last. You wouldn't take a car loan lasting longer than the car. Why would you ever authorize District to buy short-lived items at your expense? Google: School bond iPads. VOTE NO until District proposes a measure with a prioritized Project List; guaranteeing specific projects at specific sites with achievable budgets for each. There can't be real value or accountability without it. NO BLANK CHECKS! (iv) Ensure that every penny from this measure benefits College of the Canyons, and that no funds can be taken by the State. Goals and Purposes: College of the Canyons serves thousands of military veterans and their families, many of whom have recently returned from war zones and face challenges including post-traumatic stress disorder and permanent disability. Upgraded and expanded veteran services and job training are needed so returning Service Members receive the support they need to complete their education and enter the civilian workforce. College of the Canyons provides essential job training and workforce preparation for students, veterans, and local residents. Because of the changing economy, classrooms, labs and facilities need to be upgraded to provide students with up-to-date technology and expand access to training programs that help them learn new skills and find better paying jobs in jobs in law enforcement, fire safety, emergency medical care, technology and other high demand careers. College of the Canyons has partnered with the William S. Hart High School District to enable more than 900 high school students to get a jump start on their college education each semester; this partnership has helped 80% of local high school students to attend college. By upgrading our outdated classrooms and improving technology, College of the Canyons can continue to offer this partnership. � Construct new buildings that add classrooms and science labs at the Canyon Country and Valencia campuses that expand student access, help students transfer to four-year universities, and prepare them for well-paying jobs. � Add a parking structure at the Valencia Campus to provide adequate parking for students and faculty. � Construct and/or upgrade career and vocational classrooms to better prepare students and workers for well-paying jobs. � Construct and/or upgrade facilities for student support services, such as tutoring and career counseling. � Construct and/or upgrade classrooms and labs for science, technology, engineering, and math-related fields. � Expand facilities to enhance training of law enforcement officers, fire fighting personnel, emergency medical technicians, nurses and other allied health professionals, and other career education program facilities. � Construct and/or upgrade facilities that expand capacity to provide training, ensuring local businesses and industries have access to a well-trained workforce with skills needed now and in the future. � Reconstruct or upgrade the students' and veterans' centers to provide them with support programs and educational resources. Goals and Purposes: The cost to attend California's public universities has risen to at least five times that of attending a community college. As a result, more local students and their families rely on College of the Canyons to save tens of thousands of dollars. Additional funds are needed to increase opportunities for local students to earn college credits, certifications, and job skills at a reasonable price to be competitive in today's ever-changing job market. Many of College of the Canyons' buildings, classrooms, science labs, and job training equipment are outdated. This measure will address urgent and basic repairs and ensure that all buildings meet current earthquake, health and safety standards. � Repair gas, electrical, water and sewer lines. � Improve heating, cooling and energy conservation systems. � Update campus facilities to improve handicapped accessibility. � Repair to the aging plumbing system to prevent flooding and water damage. � Improve roadways and parking capacity. 1. All money will benefit College of the Canyons campuses and CANNOT BE TAKEN BY THE STATE. 3. Require CITIZENS' OVERSIGHT and yearly reports to the community to keep the College accountable for how the funds are spent. The listed projects will be completed as needed. Each project is assumed to include its share of furniture, equipment, architectural, engineering, and similar planning costs, program/project management, staff training expenses and a customary contingency. In addition to the listed projects stated above, authorized projects also include the acquisition of a variety of instructional, maintenance and operational equipment, including interim funding incurred to advance fund projects from payment of the costs of preparation of all facility planning, fiscal reporting, facility studies, assessment reviews, facility master plan preparation and updates, environmental studies (including environmental investigation, remediation and monitoring), design and construction documentation, and temporary housing of dislocated college activities caused by construction projects. In addition to the projects listed above, repair, renovation and construction projects may include, but not be limited to, some or all of the following: renovation of student and staff restrooms; replace aging electrical and plumbing systems; repair and replacement of heating and ventilation systems; acquire vehicles; upgrade of facilities for energy efficiencies; repair and replacement of worn-out and leaky roofs, windows, walls doors and drinking fountains; secure hillside stability, improve roads and infrastructure; replace or remove outdated buildings and classrooms and construction of new classrooms, science labs and support buildings; installation of wiring and electrical systems to safely accommodate computers, technology and other electrical devices and needs; upgrade facilities to meet current environmental sustainability and State compliance standards; repair and replacement of fire alarms, emergency communications and security systems; upgrading, resurfacing, replacing or relocating of hard courts, fields, turf and irrigation systems; upgrade classrooms; build or upgrade facilities for public safety training, math, physical sciences, fine arts and theatre arts; construct, expand or reconfigure facilities to create large lecture classrooms; upgrade, resurfacing and reconditioning existing parking lots and construct parking garages; repair, upgrade and install interior and exterior lighting systems; replace water lines and valves, sewer lines and other plumbing systems; construct, upgrade, acquire or expand multi-use classrooms and labs, culinary and student services, food services and health services buildings, fine arts and visual and performing arts facilities, learning resources center, physical education/aquatic facilities, locker rooms, administrative offices, warehouses and maintenance buildings, student service/campus center and instructional buildings, trades and technology building, library, athletic fields, student services buildings; improve water conservation and energy efficiency; replace or upgrade outdated security and safety systems; replace existing window systems with energy-efficient systems to reduce costs; improve insulation, weatherproofing and roofs to reduce costs; B-5 improve access for the disabled; install and repair fire safety equipment, including alarms, smoke detectors, sprinklers, emergency lighting, and fire safety doors; replace broken concrete walks, deteriorated asphalt; replace/upgrade existing signage, bells and clocks; demolition of unsafe facilities; install new security systems, such as security (surveillance) cameras, burglar alarms, handrails, outdoor lighting, fencing, gates and classroom door locks; replace sewer lines and improve drainage systems to prevent flooding; upgrade roadway and pedestrian paths for improved safety and access for emergency vehicles, site parking, utilities and grounds. The project list also includes the refinancing of outstanding lease obligations. The upgrading of technology infrastructure includes, but is not limited to, the funding of state-of-the-art projectors, portable interface devices, servers, switches, routers, modules, sound projection systems, information systems, printers, digital white boards, upgrade voice-over-IP, communication systems, audio/visual and telecommunications systems, call manager and network security/firewall, Internet connectivity, wireless systems, technology infrastructure, and other miscellaneous IT and instructional equipment, DATA storage, fiber/copper infrastructure, phones, identity access cards. The allocation of bond proceeds will be affected by the final costs of each project. Some projects may be undertaken as joint use projects in cooperation with other local public or non-profit agencies. The budget for each project is an estimate and may be affected by factors beyond the District's control. The final cost of each project will be determined as plans and construction documents are finalized, construction bids are received, construction contracts are awarded and projects are completed. Based on the final costs of each project, certain of the projects described above may be delayed or may not be completed. Demolition of existing facilities and reconstruction of facilities scheduled for repair and upgrade may occur, if the Board determines that such an approach would be more cost-effective in creating more enhanced and operationally efficient campuses. Necessary site preparation/restoration may occur in connection with new construction, renovation or remodeling, or installation or removal of relocatable classrooms, including ingress and egress, removing, replacing, or installing irrigation, utility lines, trees and landscaping, relocating fire access roads, and acquiring any necessary easements, licenses, or rights of way to the property. Proceeds of the bonds may be used to pay or reimburse the District for the cost of District staff CriticalWhat was that they said about no administrative payments? when performing work on or necessary and incidental CriticalWho do you think gets to decide? to bond projects. Bond proceeds shall only be expended for the specific purposes identified herein. The District shall create an account into which proceeds of the bonds shall be deposited and comply with the reporting requirements of Government Code � 53410. General Obligation Bonds of the Santa Clarita Community College District. $.015000 per $100 of assessed valuation, which equates to $15.00 per $100,000. Year of highest tax rate: 2026-2027 and thereafter. Estimated total debt service, including the principal and interest: $483,423,125. Section 1. That the Board, pursuant to Education Code Sections 15100 et seq., Sections 15264 et seq. and Government Code Section 53506, hereby requests the Los Angeles County Registrar of Voters to call an election under the provisions of Proposition 39 and the Act and submit to the electors of the District the question of whether bonds of the District in the aggregate principal amount of $230,000,000 (the "Bonds") shall be issued and sold to raise money for the purposes described in Exhibits "A" and "B" hereto. Both exhibits are directed to be printed in the voter sample ballot pamphlet. Section 2. That the date of the election shall be June 7, 2016. Section 6. That the Los Angeles County Registrar of Voters and the Los Angeles County Board of Supervisors are hereby requested to consolidate the election ordered hereby with any and all other elections to be held on June 7, 2016 within the District. Pursuant to Elections Code Section 1043, the Board acknowledges that the consolidation election will be held and conducted in the manner prescribed in Elections Code Section 1048. Section 7. That this Resolution shall stand as the "order of election" to the Los Angeles County Registrar of Voters to call an election within the boundaries of the District on June 7, 2016. Section 8. That the Secretary of the Board is hereby directed to send a certified copy of this Resolution to the Los Angeles County Registrar of Voters no later than March 11, 2016. Section 9. That the Bonds may be issued pursuant to Elections Code Section 15300 et seq. and pursuant to Government Code Section 53506. The maximum rate of interest on any Bond shall not exceed the maximum rate allowed by Education Code Sections 15140 to 15143, as modified by Government Code Section 53531. The Board approves the filing with the Los Angeles County Registrar of Voters of a Tax Rate Statement and primary and rebuttal arguments, as appropriate, and directs their publication in accordance with the requirements of the Elections Code. Section 10. That the Board requests the governing body of any such other political subdivision, or any officer otherwise authorized by law, to partially or completely consolidate such election and to further provide that the canvass be made by anybody or official authorized by law to canvass the returns of the election, and that the Board consents to such consolidation. Section 11. Pursuant to Education Code Section 5303 and Elections Code Section 10002, the Board of Supervisors of Los Angeles County is requested to permit their Registrar of Voters to render all services specified by Elections Code Section 10418 relating to the election, for which services the District agrees to reimburse the County such services to include the publication of a Formal Notice of School Bond Election and the mailing of the sample ballot and tax rate statement (described in Elections Code Section 9401) pursuant to the terms of Education Code Section 5363 and Elections Code Section 12112. ADOPTED, SIGNED AND APPROVED this 9th day of March, 2016.